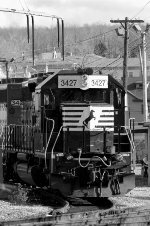 Description: NS 3427 is on the point of train 457 at Alburtis, PA 10/2000. Description: NS 3427 has a NS SW1500 in the consist. Description: An eastbound train comes under the PRR style signal bridge at Leetsdale. Description: NS 622 approaches the 8th Street crossing. Description: An NS Empty Coal Drag heads Westbound at Cassandra, PA with 3 SD40-2's on the point. Description: Up front on this coal train were SD40-2s 3368, 3427 & 3379. There were four SD40-2s on the rear. Description: The middle unit on this eastbound coal train is in "horse head" paint. Description: An eastbound double stack has the railroad while the other train waits to go 2 to 1 at CP "MO" for her trip down "the slide". Title: When SD40-2's provided the help!!!!!!! 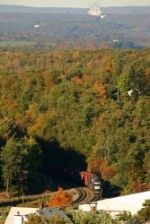 Title: NS 3427 pushing an empty coal drag down "The Slide"
Description: These helpers will uncouple from the 17G west of CP C and then will crossover from track three to one to help the 10N over the grade. Description: The Helpers that were on 17G will now couple on to the 10N on track one. Description: The eastbound ethanol train with a helper set on the head end pulling through Conemaugh, PA. Description: The ethanol train's head end helpers rolling east.